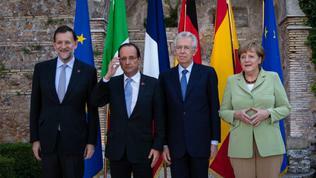 At the end of the week, European leaders will gather in Brussels for another "decisive" European Council summit. 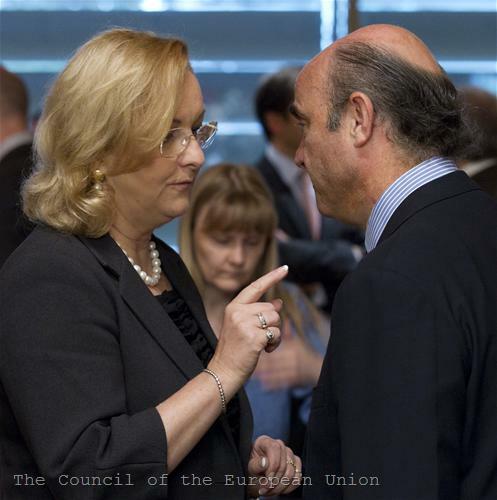 Many times during the past year their meetings were described as critical and results were expected to reverse the course of the crisis. But this did not happen or at least not with the expected scale and speed. Before the European Council in December 2011 many argued that the countdown was running out for the euro area and that there were months, weeks, a few days left until collapse. A week before the summit on 28 and 29 June Mario Monti, Italy's prime minister, said that leaders had seven days to save the common currency. 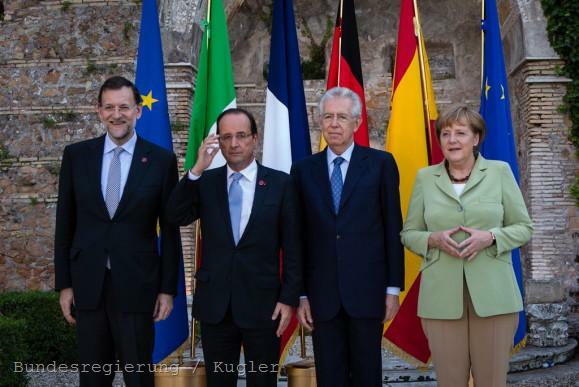 On Friday, 22 June, the leaders of Germany, France, Italy and Spain gathered in Rome in an attempt to resolve their differences before the EU summit. According to international media, however, Angela Merkel, Francois Hollande, Mario Monti and Mariano Rajoy had not reached understanding on the contested issues. German Chancellor Angela Merkel resisted pressure by her colleagues the eurozone rescue funds to be allowed to directly recapitalise banks and buy government bonds without a formal rescue programme. According to Spain, Italy and France, this is the only way the euro area to survive under increased market pressures, combined with problems in the banking system. The IMF also supported direct recapitalisation of banks by bailout funds in order to break the vicious circle between banking and debt crises. Germany, for its part, disagrees with the changes because it believes that money should be granted only under certain conditions and guarantees that these will be met. Such conditions can be ensured only through an adjustment programme, and performance can be guaranteed only by governments (not the banks as they are private institutions). Besides, Berlin insists, before taking any common measures, including fiscal transfers and debt sharing, member states to cede more powers to Brussels for centralised control. For this reason Germany is not willing even to discuss introduction of Eurobonds, which the European Commission, the European Parliament and the IMF have called for. "Liability and control belong together," Angela Merkel said after the Rome summit. The French position is right the opposite: "There can be no transfer of sovereignty if there is no improvement in solidarity," President Francois Hollande stated. It is expected at their summit in the end of the week leaders to achieve more concrete progress in terms of the banking union, of the establishment of which both Brussels and the IMF said was an urgent priority for the euro area. This includes recapitalisation of banks, a common bank resolution fund, a common deposit guarantee scheme, a common EU regime of bank regulation and supervision. In Rome, the leaders of the four largest eurozone economies have agreed to introduce a Financial Transaction Tax in the form of enhanced cooperation, after it became clear that no unanimity could be reached at the Council of Finance Ministers for the introduction of FTT at EU level. 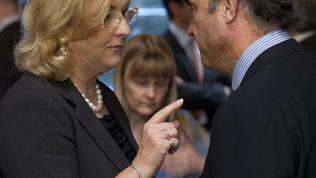 At the EU finance ministers (Ecofin) meeting on Friday, 22 June, Austrian Finance Minister Maria Fekter urged her colleagues to take part in the enhanced cooperation, admitting bluntly that unless FTT was introduced the Austrian parliament would not ratify the treaty establishing the permanent rescue fund for the eurozone – the European Stability Mechanism (ESM). From the statements of ministers it became clear that the required minimum of nine countries to establish enhanced cooperation was in place, although some countries apparently accept the idea with reluctance. In turn, the rest of the Member States declared that they would not impede their partners willing to implement FTT but insisted on guarantees that this would not harm the single market. In Rome, the leaders also have confirmed their commitment to support a package amounting to 130 billion euros (1% of European GDP) to promote economic growth. The measures include increasing the European Investment Bank`s capital, redirecting unused EU funds, implementation of project bonds to finance large infrastructure projects of European importance. 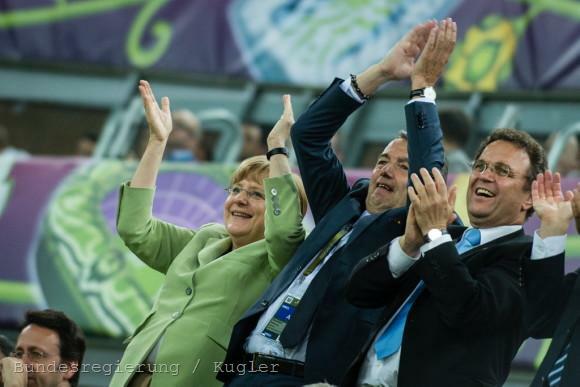 The summit of the four leaders on Friday lasted less than two hours because Angela Merkel was in a hurry for the Germany-Greece match in the quarterfinals of Euro2012. Although it eliminated Greece, Germany is on to the semifinals in the company of distressed southern economies - Spain, Portugal and Italy. 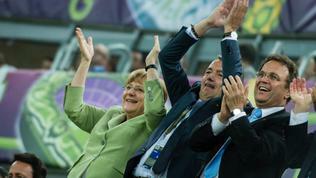 Ironically, everyone wants to beat Germany on the football field but politically and economically all hope for Germany's goodwill. For Angela Merkel it will be extremely difficult on Thursday night, not only because of the friendly fire which she will be subjected to, but also because she will have to miss the semi-final football match of her Germany against Italy for the summit in Brussels.